for this one.. im using the red soap for the flower and yellow soap for the stand..
Beside than making a soap flowers i also made a card and put the soap that i alredy carve as a frontpage of the card... it come from many shades, colors and style. Carving a soap is a fantastic hobby for me. This hobby is started past 5 yr. from the interest of smelling the smell of the soap.. i try to carve the soap with the simple carving until it become a beautiful flower. 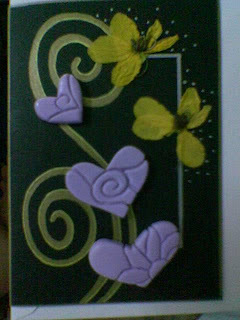 Now carving a soap is not just a hobby for me.. but i make it as a buisness..
every soap flowers ready with their own box. The box of the soap flowers also made by me.. and it come from many colors and styles. apa pendapat anda dengan hasil kerja saya,?